I love blue and pink together, so I like to wear it year-round. While I do tend to wear more neutrals in winter (it makes layering easy as everything goes), it's nice to add a little bit of colour or a fun print to your outfit sometimes. The cobalt leather jacket I'm wearing in the outfits below is both cosy and colourful, and paired with pink it makes for a cheerful winter outfit. A neutral bag is an essential in both outfits while I have so much else going on with the prints and colour. Had a busy but kid-free few hours when I wore this. The beading on this ombre tank is beautiful but I worry about how it will hold up with tiny little grabby hands so it's been a while since it was last worn! I was pregnant with Baby Boy when I last wore it. 😲 Definitely a piece that feels more special and doesn't get worn for everyday stay at home mum duties. When I was thinking of what to wear and putting this outfit together I worried it maybe had a little too much going on, with the beaded ombre tank, bright cobalt jacket and printed jeans. But I loved this final outfit. The neutral Balenciaga bag was a good choice so it didn't compete with all the print and colour. I was happy and comfortable all day, despite running late to almost every appointment, oops. Last worn: cobalt leather jacket, ombre beaded tank, Sass & Bide printed jeans, Converse Chucks, Balenciaga part time bag. Other ways to wear: cobalt leather jacket and pencil skirt, ombre beaded tank and blazer, Sass & Bide printed jeans worn two ways, Converse Chucks and dress, Balenciaga part time bag and striped dress. Perfect for pregnancy: ombre tank hiding an early baby bump, Balenciaga part time and maternity pencil skirts. This was what I wore for the instagram style challenge prompt of 'shop your wardrobe'. Which applies to every outfit I've worn since my last purchase in December! I didn't plan anything special to meet the style challenge prompt for the day, I just wanted to wear this tank and the leopard print jeans together as I thought it would be a nice combination. Again I went with a neutral bag, the metallic mini MAC, as my outfit felt quite busy already with the colours and print together. I felt completely different in this outfit compared to the one above though. I'd been so sure about this as I planned it out in my head, only to put it on in the morning and felt it was missing something. I added the necklace but I'm still not sure that was what the outfit needed - maybe a scarf instead. As we were running late for books and rhymes at the library I just wore it anyway. Not one of the worst outfits I've worn, as I didn't completely hate it, just another of those cases where the outfit doesn't look as good as you think it will in your head! I did really like the cobalt jacket and leopard print jeans together at least - I'll have to try that again soon. Last worn: cobalt leather jacket (above), metallic tank, pink leopard print jeans, Converse All Star, Rebecca Minkoff metallic mini MAC. Other ways to wear: cobalt leather jacket and dress, metallic tank and chambray, pink leopard print jeans and blazer, Converse All Star and maxi skirt, Rebecca Minkoff metallic mini MAC and denim shorts. Perfect for pregnancy: leopard print jeans in early second trimester, Converse and maternity shorts, mini MAC worn as a clutch in third trimester. While neutral layers are practical and make winter layering easy, you can have some fun with your outfit by adding more colour, as statement print, or both! If you're experimenting with colour and prints in your outfit, you might want to pick a classic neutral handbag that won't compete for attention. Summer tanks can be a fun addition to your winter wardrobe, and with the right layers can be worn year round. While I'm wearing a colourful leather jacket above, a bright cardigan or scarf would work just as well to add more colour. Printed jeans can also be worn year-round to add another element of interest to your outfits. In case you have missed the 1000 other bloggers posting about it, the Nordstrom sale has kicked off! Linking up with Mummy Mondays, Shoe & Tell, Hello Monday, Mix It Monday, On Mondays We Link Up, Weekend Wear. Love these outfits!! They are too cute! The color of the jacket is really amazing, but I am not a huge fan of pink, so I guess I would style it differently. The leopard print jeans are beautiful though. That jacket is just fabulous - I love it so much. What a statement piece for you! Have a lovely weekend, my dear! I love the pink and blue color combination! And most of us have these colors in our wardrobe so there are many ways to mix and match them. The blue jacket is gorgeous with your pink leopard print jeans! And I think the necklace looks good with it, too. You are being too hard on yourself! A scarf just gives you another outfit option. the blue jacket is so cute! Love both jeans, amd the pink ombré top! So well styled ! Pink and blue is such a pretty color combo! I hate it when that happens!! If an outfit doesn't look as well as it did in your head I mean. But guess we all experience it from time to time. Anyhow I think yours turned out rather nice! And the leopard jeans are just lovely. Such a cute look! I love that ombre tee! Love those outfit ideas so much, esp the combo of pink & blue. I thought I was the only one who loves that :) How comfy do those pants look!! Also, being comfortable is so important, esp if you have a lot of errands to run. I love that first outfit, I don't think there's too much going on at all, you look sassy! This colour combo of blue and pink is definitely a winner! I don't think I've every put these two colours together....thanks for the inspo:) That cobalt jacket definitely went well with both pairs of jeans as well. Looking fab! These jeans are so much fun! Yo have styled them so well. I love bringing a bit of colour into my outfits! You look amazing, love the color combination!!!! 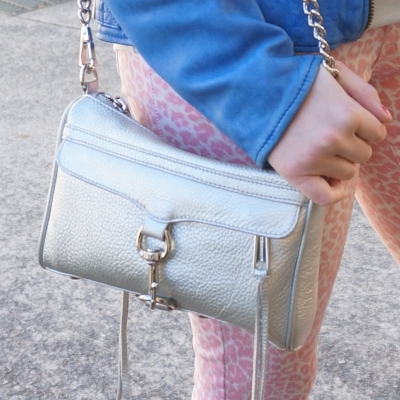 Obsessing over your metallic Rebecca minkoff! So pretty and those leopard jeans are so fun! Love the patterned jeans! I haven't actually seen anything like them before so I must not be looking in the right places! I love that Balenciaga! And that cobalt is such a good color on you! My favorite is the second outfit! So cool Mica! I love splashes of color and its great for the Winter. Oooh, love these printed jeans! I've never been brave enough to wear them but they look so good on you!